← Fire up the Alfa! 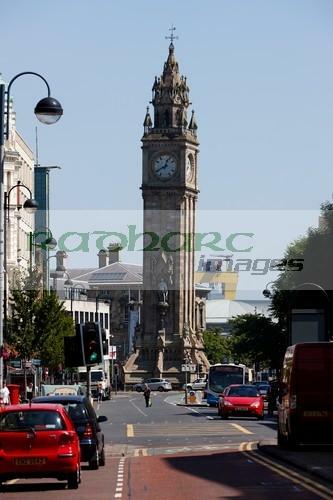 With all the travel its easy to forget that the majority of my business is here in Belfast, Northern Ireland. Although exporting makes up most of the revenue, the majority of my time is spent in and around Greater Belfast and throughout Northern Ireland for my main NI, UK and International clients. At home I mostly concentrate on commercial and corporate photography, the majority of it being in public relations and advertising. One morning after meeting a client for coffee in Belfast city centre I decided to go wandering with the camera. 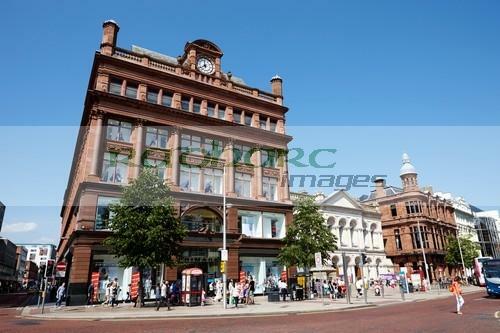 It was one of those rare occurrences of that strange natural phenomena that is sunshine on a summers day in Belfast. 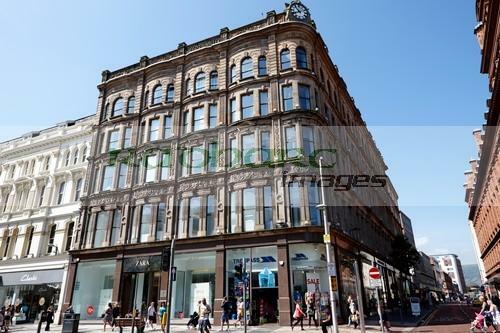 Born and bred in Belfast this is my physical as well as spiritual home but it is a rare for me to spend any time now in the City centre when not at clients or at venues. Like a lot of cities it is constantly changing and bears little resemblance to the Belfast I knew growing up at the height of the troubles. 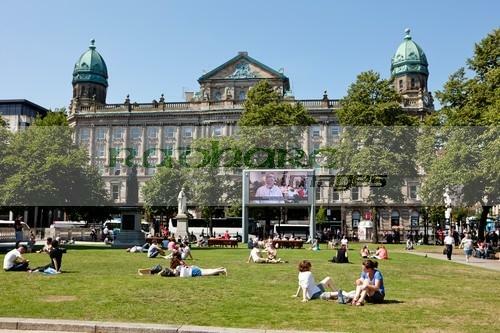 The security checkpoints are gone, people are happy to sit out with their lunch in the grounds of the City Hall in peace and quiet that was unrecognisable 30 years ago. 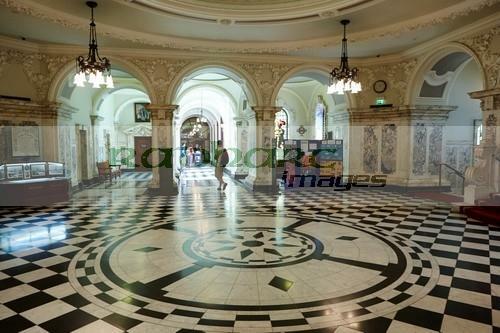 The City Hall itself has seen lots of changes, both from an aesthetic as well as political point of view and is now a main stop on the casual tourist trail and I recommend the guided tour for travellers both foreign and domestic! We still have a long way to as regards tourism, a subject Im quite happy to rant about for hours. It is good to see some sort of a street cafe culture developing in certain parts although as I say we have a long way to go. I remember as a kid, walking down through the city centre on a sunday with my dad, brother and sister. Everything was closed of course but it gave us the opportunity to look in all the shop windows and anyone in Belfast of a certain age will remember the Leisureworld window full of toys. In my case it was the big helicopter with the Action Man in it. Round the corner was Anderson and McAuleys the big department store where I (and probably everyone else in Belfast) remember buying my first toy. It was again an Action Man and I must have been about 7. I also remember falling down the stairs in Anderson and McAuley, a hard thing to do fall down two flights of stairs, with a landing in the middle. I have no doubt to this day that it was my paddington bear style duffel coat that saved me from serious injury. Back in the day when if you fell down the stairs it was your own stupidity, not the grounds for a law suit. Across the road from Anderson and McAuley was the Bank Buildings, named not after a bank but because it stands on the banks of the river Farset, the river that gave Belfast its name and High Street where the ships used to come in (long before my time). Standing in High St of an evening you can sometimes hear the river running underneath and a view down the street at our own leaning clock shows the path of the river. Bank Buildings still is home to primark and I remember aged about 11 or 12 stopping off on the way home from school to buy my first set of trainers. It was also the site of one of my Dads more interesting stories. He was standing at the back entrance waiting on my Mum coming out from shopping. The police and army were running up and down the street evacuating people due to a bomb scare. Eventually my Dad was the last one standing in the street and asked a soldier what the story was. ‘There’s a bomb in a van somewhere’. ‘Have you looked in this one?’ asked my Dad pointing to the van he had been leaning on for the last half hour. The soldier then described that they had all thought it was my dads van and how silly a fellow he was to be standing there as he grabbed my dad and they both ran (language was a bit stronger than that). Less than 10 mins later there was a rather large crater where the van and my dad had once stood. Sometimes it pays to be a nosey bugger and if everyone else is running away, you run too. Of course there are very few reminders of the Belfast past these days so even if you are from the city, take the time to wander down through the city streets, past city hall, go on the tour, wander down to the river and then back up through cathedral quarter and stop in somewhere for a coffee, a pint or a fry, or all three. Get re-acquainted with the city.